The Washburn Hannah Montana is a great guitar for smaller hands. Inspired by the Disney Channel’s show Hannah Montana, this guitar reflects the hard-working spirit of the Washburn employees who craft and design it. You’ll feel confident knowing that this guitar represents the finest quality at the best possible price. 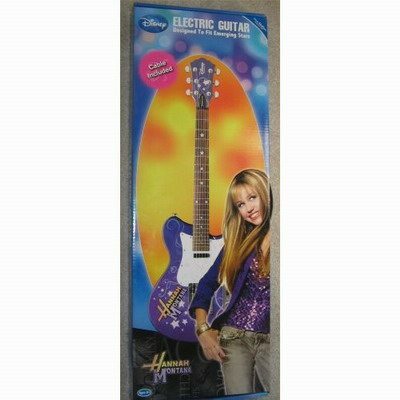 Featuring a select hardwood body with a comfortable shape and size perfect for a young girl, easy to use controls and a great pop star look, including star shaped fretboard inlays, the Washburn Hannah Montana electric guitar is ready to play. With the Pilsen’s coil-tap technology, you have the flexibility to shift the dual Seymour Duncan pickups from a hammering humbucker crunch to a razor-sharp single-coil scream with just a flick of the wrist. Like all Washburn USA guitars, the Washburn Pilsen Idol Guitar incorporates the Buzz Feiten Tuning System for unsurpassed intonation. A stop tail with a TonePros tune-o-matic bridge, stop tailpiece, and 18:1 Grover tuners hold you in tune. 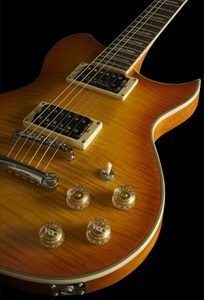 With its long sustain, sweet tone and ergonomically design, the Pilsen Idol PI70 guitar easily competes with the others USA custom-built guitars that cost four times as much. The Washburn PI70 Pilsen Idol: a shining example of gritty American ingenuity. In 1999 Washburn’s master craftsmen set out to design a modern classic for the new Millennium and the Idol was born. After countless awards and accolades, Washburn has now expanded the Idol family to an even more versatile instrument. In conjunction with Nick Catanese of Black Label Society, Washburn is now pleased to present Washburn Nick Catanese NC70 Signature Idol Guitar with the phatest neck known to man. This premium USA Custom Shop guitar boasts a figured maple top with ET (Evil Twin) graphics, EMG Zakk Wylde electronics, inlayed ET at the 12th fret and an oval skull inlay on the headstock. The Washburn Nick Catanese Electric Guitar features also exclusive Grover 18:1 gear ratio tuners. Washburn is the only major guitar manufacturer to incorporate the Buzz Feiten Tuning System as a standard feature on production guitars. The Washburn WI66PRO Electric Guitar features a semi hollow body, arched f-holed top. The revolutionary VCC, deluxe black chrome hardware including Grover 18:1 tuners combine to make a truly striking and deluxe guitar. 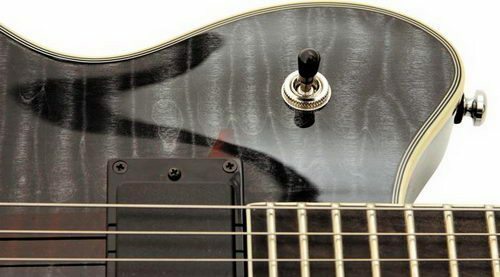 The VCC Tone Control System is a unique coil tapping system that allows players to incrementally blend between a humbucking sound and a single coil sound without the hum normally associated with single coils. The Washburn WI66PRO, along with the WI66PRO, marks the return of pearl wing fingerboard inlays to the Washburn line. The set neck allows a slim neck joint and offers comfortable access to the upper register. No batteries or preamps needed! The Washburn WI66PRO Electric Guitar features a bound, carved flame maple top, gold top on the WI66PROG. The revolutionary VCC deluxe hardware including Grover 18:1 tuners combine to make a truly striking and deluxe guitar. VCC (Voice Contour Controls) allow you to dial in a single coil sound from the dual humbuckers like a coil split. This washburn guitar, along with the Washburn WI67PRO, marks the return of pearl wing fingerboard inlays to the Washburn line. The set neck allows a slim neck joint and offers comfortable access to the upper register. All the different tone possibilities make this a great guitar for any style. In 1999 Washburn’s master craftsmen set out to design a modern classic for the new Millennium and the idol was born. After countless awards and accolades, Washburn has now expanded the Idol Family, to an even more versitile instrument. If you like the shape and design of the award winning Idol guitar but are just starting out, this axe will increase your enthusiasm to begin playing. A professional guitar at an entry level price, the Washburn WI14 Electric Guitar has many of the features of its big brothers and the playability typical of the entire Idol family. Comes in a high gloss finish in 4 colors with a comfort contour cut into the body to make it easier to play on. If you are an experience player and looking for that reliable guitar to throw in and out of the car, this musical instrument may be the one for you.